LG vs Samsung, passive vs active: 3D ping-pong, anyone? | What Hi-Fi? LG vs Samsung, passive vs active: 3D ping-pong, anyone? Last week it ran ads in the US press saying 'Hey, Sony and Samsung – Better stick to 2D', leading Samsung to counter with its own survey showing just how much of a grip it has on the US 3D market. John Revie, boss of the company's visual display marketing in the States, told trade magazine TWICE that for the period from May 22nd to June 18th, Samsung had a 61% share of the US 3D TV market, building from a 50% share in April-May. He also pointed out that it's doing its bit to make 3D glasses more affordable, thus answering one of the main criticisms from the passive 3D camp: US buyers of its 3D TVs will get two pairs of glasses free, and the prices on extra pairs of glasses have been reduced to $50 (just over £30). 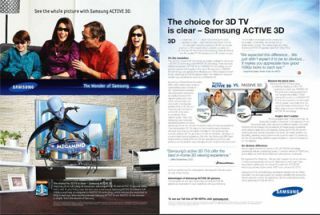 Samsung is also running ads in the specialist press in the States emphasising what it sees as the superiority of its active 3D over the Film-type Patterned Retarder technology being promoted by LG. LG has answered one of the criticisms of passive 3D – that it's not full HD – with the announcement that Frankfurt-based VDE, one of the largest testing and standards organisations in Europe, has certified its Cinema 3D TV as full HD in 3D mode. The president and CEO of LG's Home Entertainment Company, Havis Kwon, says that 'This latest certification proves beyond all doubt that LG’s Cinema 3D TVs, which already provide the most comfortable 3-D viewing experience, deliver 3-D in full HD. 'The dispute over LG’s TV had centered on whether the company’s Cinema 3D TVs truly qualified as Full HD, defined as a horizontal image containing 1,080 lines of definition. LG’s Film Patterned Retarder (FPR) technology, used on the Cinema 3D TVs, creates the perception of 3D depth by delivering two 540 line images, one for each eye, that are then combined via the glasses to create a unified 1080p image. 'The ruling from the VDE delivers the clearest affirmation to date of the validity of LG’s FPR technology, and Cinema 3D TV has already received a string of endorsements from other institutions and agencies. Oh, and just to keep the war of words cooking, LG has also announced that two of its 47in TVs have become the first 3D models in Europe to receive the Carbon Reduction Label from the Carbon Trust, indicating their green credentials. The company says that 'Through innovations such as Edge LED and the Local Dimming System, the 47LW5500-ZE and 47LW550T-ZE use more than 30% less energy compared to conventional models in the same class. 'And with Smart Energy Saving, LG’s own energy reduction technology, the LCD TVs further reduce power consumption by up to 70%. So, either that brings to an end the 3D format battle between the Korean giants, and we can all move on, or it's time to say 'Your move, Samsung'. Anyone want to take a wild guess on which it will be...?